A Phd is the fundamental training course for scientists. In management research, this is the training to become a social scientist. A PhD thesis is in effect the students supporting documentation in an application to become a member of the social scientist community. The central assessment of a PhD is its original contribution to theory/knowledge. Through the efforts of many social scientists, all presenting their small original contribution, the field evolves. The video below is a short talk given by Rachel Pyke (a climate change scientist) and is a wonderful explanation of how knowledge is built up in a field. To get an idea of what a PhD entails it is worth talking to students who are coming towards the end of their studies. They will be able to give you a perspective on what is involved over the course of your studies. There are a number of books on the market to describe the PhD process. 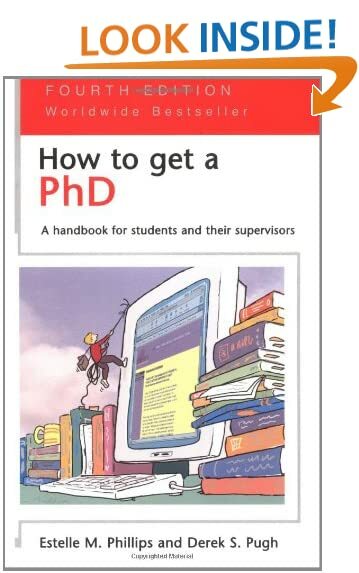 How to Get a PhD by Phillips and Pugh is an excellent starter and not a particularly difficult read. If you want the shortest description ever, take a look at this Illustrated Guide to a PhD. There is a little bit more about how to write a thesis here. It is also pretty easy to find Open Access thesis repositories. If you want to look at one, my thesis is available here.